Make the most important meal of the day the most flavorful, too, with this twist on the classic eggs benedict. 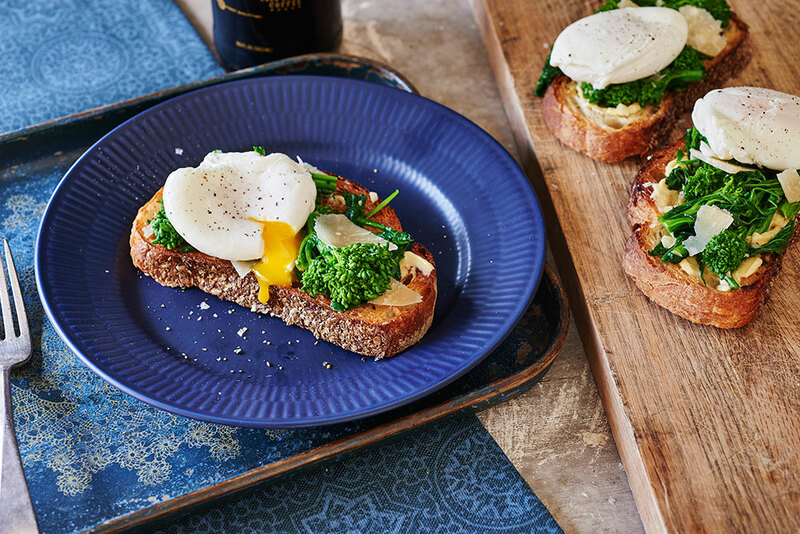 It’s cozy, rich, and yet bright enough to still feel a little refreshing, thanks to the mild acidity of Broccoli Rabe and a zingy lemon hollandaise. On top of serving as a nutritional powerhouse, the Broccoli Rabe adds the right punch of pungency to complement smoky bacon and creamy hollandaise. 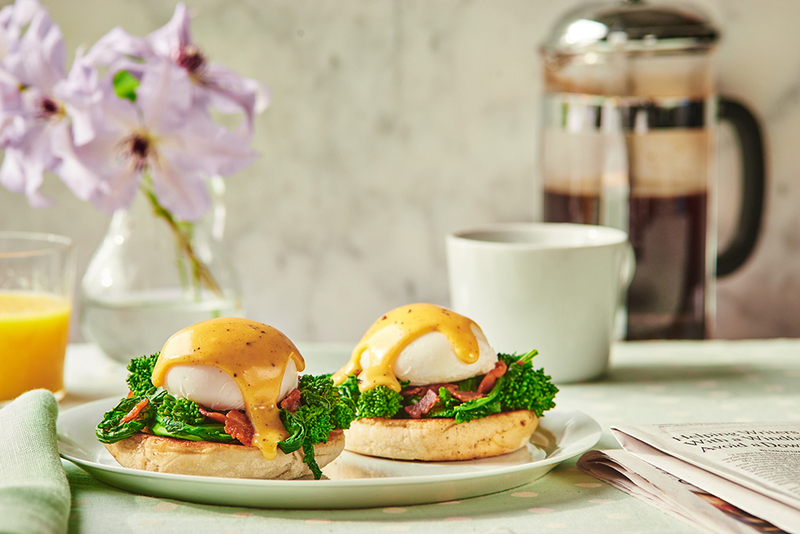 And to make a lighter, easier hollandaise sauce like this one–with a lemony, garlicky finish–all you need is a blender! Andie is the voice of andiemitchell.com, a food and lifestyle blog dedicated to helping people achieve their wellness goals. She is also the author of two books, It Was Me All Along, her NYT best-selling memoir, as well as Eating in the Middle, her first cookbook. 1. 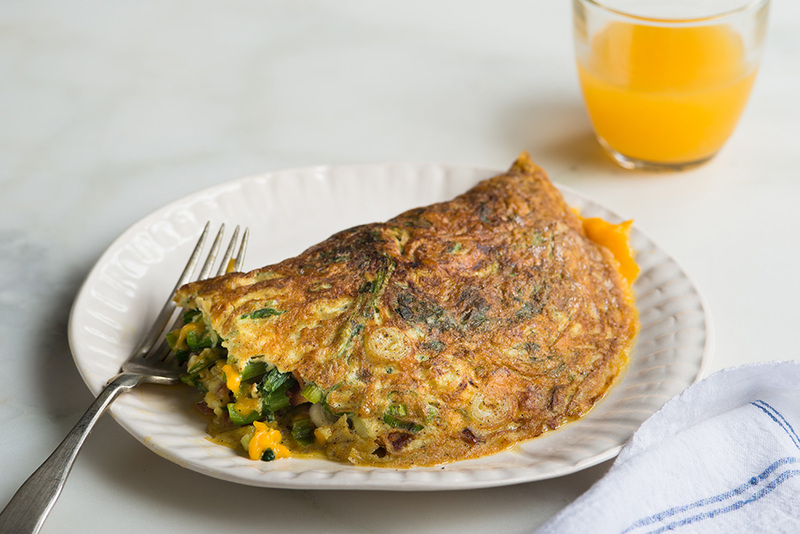 In a blender, combine the egg yolks, lemon juice, garlic, paprika, salt, and pepper. Pulse until smooth. 2. Place the butter in a small microwave-safe bowl and cover the bowl with a damp paper towel to prevent the butter from splattering. Microwave on high until completely melted and beginning to bubble, 1 minute. 3. With the blender running on its lowest speed, slowly add the hot melted butter, processing until smooth. The sauce will thicken as it cools. Pour into a serving dish and whisk well before serving. 4. 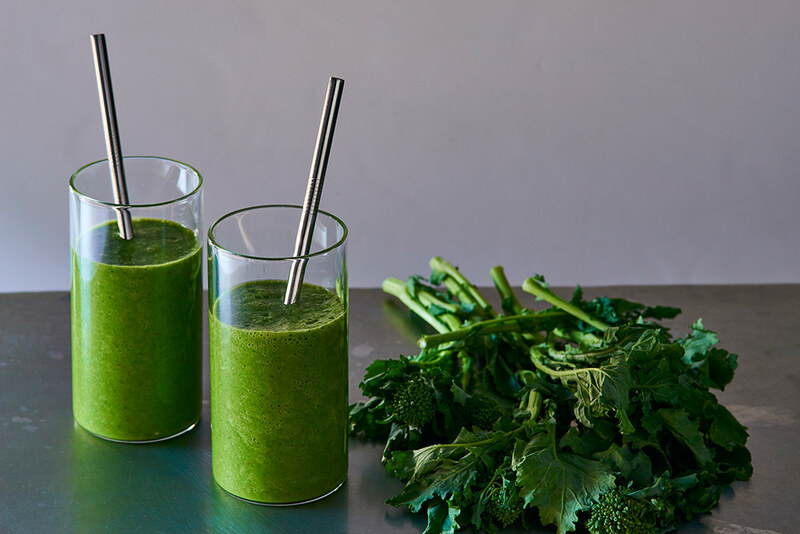 Blanch the broccoli rabe: Bring a large pot of water to a boil. Add the broccoli rabe and cook until bright green and just tender, 2 minutes. Use a slotted spoon to remove the broccoli rabe from the water and place in a colander. 5. Cover the pot of water and reduce the heat to medium-low to keep at a gentle simmer so that you can poach the eggs before serving. 6. Make the bacon: In a large nonstick skillet over medium-high heat, add the bacon pieces in a single layer and cook until crisp. Transfer to a paper towel-lined plate and drain all but 1 tsp of the bacon drippings from the skillet. 7. 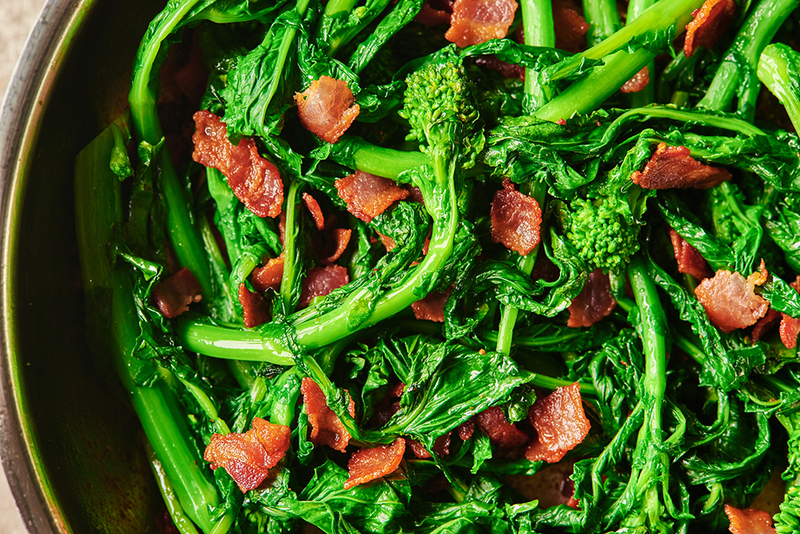 Add the blanched broccoli rabe, tossing the pieces in the bacon drippings, and cook until the broccoli rabe begins to lightly brown and is fully tender, 3 to 4 minutes. Turn off the heat and return the bacon to the skillet. Stir in the basil. 8. Split the English muffins in half and toast them. 9. Poach the eggs: Remove the lid from the pot of water and adjust the heat so that the water is only gently bubbling. Add the vinegar. Crack one egg into a small bowl, lower the bowl in the pot so that it’s close to the water, and carefully let the egg slip into the water. Cook until the egg white is fully opaque, 2 to 3 minutes. Remove the egg from the water and drain on a paper towel-lined plate. Repeat with the remaining eggs. 10. Assemble: Place 2 English muffin halves on each of 4 plates (allowing for 1 full muffin per person). 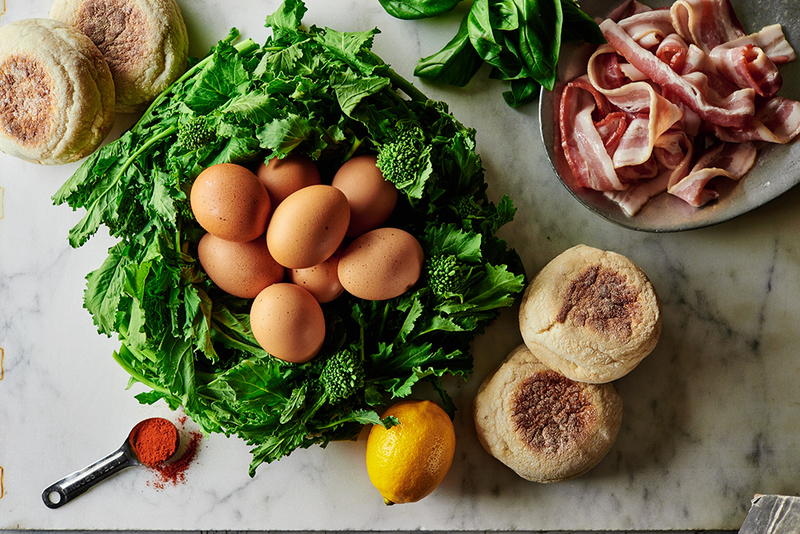 Divide the bacon and broccoli rabe among the muffins and top with a poached egg. Spoon 1 Tbsp of the hollandaise sauce over the top of each muffin. *Note that you will have slightly more hollandaise than you need. Cover and store the remainder in the refrigerator for up to 2 days. Serve immediately.